Now home to The Hours bookshop and café, this is one of the few surviving buildings in Brecon from around the time of cartographer John Speed. His 1611 map shows houses lining “Shepe Stret” (which meant "Sheep Street"). The building is dwarfed by its later neighbours, although the steep roof does its best to compete! It was built as a cottage, in the 17th century or possibly in the 16th century – when Brecon enjoyed prosperity and growth during the Tudor dynasty. The upper storey projects forward over the shopfront, which was added in the 19th century. The building’s original frontage has a timber frame, with the spaces between the framework filled with rubble. 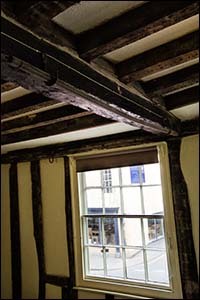 The frame is clearly visible inside the first-floor room (pictured right), where you can also see various antique nails and hooks. The café at the back of The Hours occupies the site of a former stable, where a horse and cart were once kept. The building has had many uses over the centuries. In 1900 a 23-year-old baker called Davies was living here and seeking work. In the late 1970s or early 1980s the shop became home to one of Wales’ first specialist retailers of wholefoods, called Top Drawer. As well as being a bookshop and café, The Hours exhibits Welsh art and hosts literary and other events. It’s named after the working title of Virginia Woolf’s novel Mrs Dalloway. A 2002 biopic about the author was called The Hours and starred Meryl Streep and Nicole Kidman.